Lights, Camera, Action! It's time to raise the curtain and put on a show with the HABA Glove Puppet Grandma! 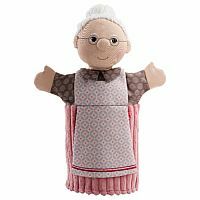 Grandma is ready to tell stories or be a part in any theatrical production your little one puts on. Perfect for ages 18 months and up. Use with other HABA puppets and the Puppet Theater, sold separately. Measures approximately: 10.50 x 7.50 x 3.50 inches..